First of all; What is a Bug Out Vehicle? A Bug Out Vehicle, BUV, is a Vehicle, that could be one you drive or foot power so that you can carry more if you need to leave your location in a Disastrous Event. Think Evacuation Situation. What could drive your from the comfort and Safety of your home? Weather, Tornadoes, Mud Slides, Volcanoes Eruptions, Neighborhood Sink Holes, Financial Collapses (Country Wide or Personal), Earthquakes, Floods, Chemical Spills, Fires, Hurricanes, Even Wars that could come On Our Own Shores. And most of all, Have you read what the Bible Says about End Times? We have all seen the footage on the TV News of different, many different Country Citizens Evacuating from their homes for one reason or another. Lord knows it could happen here too. The truth is not only "You Never Know", the Boy Scouts Have Always Had It Right! "Be Prepared". I was raised to stock up and be ready. My Father (and his brother and cousins) fought in WWII and his Father, my Grandfather(s), mother's side too, (and brothers and cousins) fought in WWI. My Father was a Hunter, he Fished and Gardened. We always had a LOT of food in our home. My Father was also a Boy Scout Master. So this Be Ready idea is not a new thing to me. A BOV could give a person would have a better chance of getting out of the Cities quicker then if they left on foot. However, with everyone leaving, you might be better with some BOV's than others....such as a Bicycle. The type and size of the BOV depends on the size and health of the person it belongs to, and how far they are planning to travel. It depends on how many items you are planning to carry. Color of the Bug Out Vehicle? Ha3 This will open a can of worms in different circles when this question is asked. Most people will tell you ONLY Camouflaged Vehicles will do. Me? I say a Bright Lime Green BOV is better than NO Bug Out Vehicle. The idea of a BUV is so that you can not only get out of town quicker, but also take more with you when you leave. What should you take? Have a look at the 101 Items For Your Bug Out Bag I have on this site listed in our Navigation Box at the right. Are there really 101 types of BUVs? Probably, but I am not sure I will think to list them all. And yes. Some are better than other. Of course a Tank would be better than a Bicycle. But this list has a wide variety of ideas and hopefully a BUV for every bank account. 1. Obviously the Vehicle you drive everyday. If you do not, start now, keep your gasoline tank filled. Fill the vehicle long before it is half empty. 2. A Pick Up Truck or Panel Van set up and loaded, ready to go, that is just for Bugging Out. Most of us could not afford such a vehicle. However, many of us HAVE a Pick Up Truck or Van or Suburban or that type vehicle. Use it everyday, as you have been, and keep your items ready to go, all together, ready to load into the vehicle and go. 3. An Old Army Tank. 4. An Old Army Truck. 5. A Van or Truck or such Vehicle that you have overhauled or give a Bug Out Make Over to make it bullet proof and covered the windows. 6. An old Hippy Type VW Bus complete with the kitchen they were know for. 8. Pull behind Camping Trailers. 9. A Trailer you made yourself to suit all the needs you and or your family members will need in a Bug Out Situation. 10. Just the small Trailer you have had for years that hauls your ATVs out to the country for fun rides on Sundays. 11. Snowmobiles...of course you will/should have snow for these. 13. Motorcycles with Saddle Bags. 14. Motorcycle with Trailers and or Sidecars. 15. Your Bicycle, even the one your have not ridden in a few years can make a GREAT BUV. Mountain Bikes are better made for off road riding, as well as to carry loads, but any bike could be used. Even if you just stick boxes on the back and go...you might want to cover these with a Tarp. 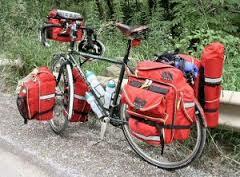 You can buy all sorts of Bags and Panniers for Bicycles. 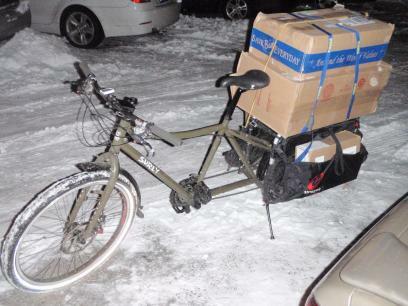 However, do not overload your Bicycle, the Tires will blow. Know too, that some bike tires, the spoke area, are made better than others. 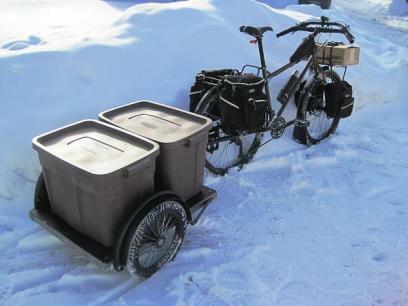 A Bike Trailer, even one make for a child would be a better way to haul your items out of town. 16. Rickshaw. You might be able to build one of these with a welder to have it ready to go. 17. Wagons. Either a Child's Wagon or a Garden Wagon can be used to carry quite a little camping items and get you on your way. 18. Scooters. Put on your Bug Out Backpack and goooooooo! Nuematic wheels would be better than one with "Razor" wheels, but a Scooter, even if "ditched" later would give you a good start out of town. 19. Don't overlook or leave behind the Family Pet. 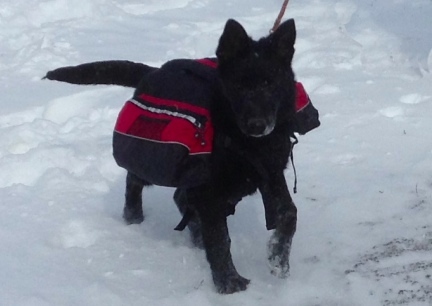 Your dog can be trained to carry up to 25% of it's body weight in a Backpack. 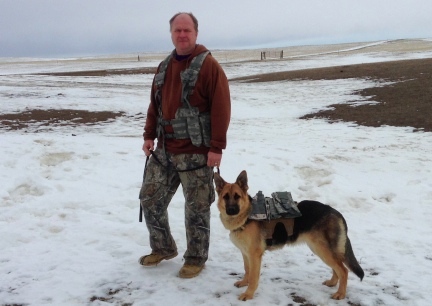 Have a look at our Training and Idea Page for teaching your Dog To Backpack on www.WorkingGermanShepherdDogs.com or www.DogStarKennel.com or www.WorkingBigDogs.com Don't wait until the day of leaving to train your dog. Throwing a heavy backpack on it's back without training and conditioning it, is Cruel. 20. Roller Skates ~ If you know how to skate! 21. Cross County Skis. If there is snow on the ground and if you know how to ski. Evacuation Day is NOT the day to learn to Ski (or Skate). 22. Ice Boats. Ice Boats are very large, rectangle Plastic Sled that are used to pull equipment out on the ice to go Ice Fishing. If there is snow on the ground an Ice Boat, covered after filling, could be used for a BUV. Just remember, if there is no snow packed trail, the going will be rough. 23. A Sled or Toboggan...again, only with a Snow Packed Trail, will these be easy to pull or ride. 24. A striped down Riding Lawn Mower. You could take the blade off and make a trailer for a Riding Lawn Mower and be able to get around where other motor vehicles can not. 25. Take the motor off a Push Mower and add a box to hold your items. Pushing your Bug out items will be easier for some than carrying it on your back. 26. Vehicles are not just those with wheel, vehicles can be four legged: This is Otis a Pack Goat we spent many miles on the trail with. He could carry quite a lot of camping items and did. 27. A Boat. But only if you live near a River or Lake. 28. A Ship or Yhayt. Again, only if you live near Large Lake or Ocean. 29. Skate Shoes....really? These could only be used on the sidewalk, and there, not too well. 30. Dune Buggy. Great Choice for open fields or sandy areas. 31. Dog Sled. Only if you have trained dogs and there is snow on the ground. 32. Skijoring. 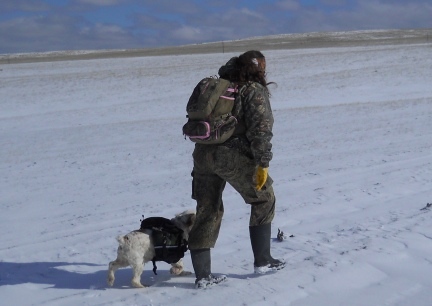 Having a Trained Dog pull you on Skis, with or without a pulk. A Pulk is a small (Ice Boat) sled that is usually covered. 33. Not many people have them in the City, but some do at Stable. A Horse with Saddle Bags. 34. A Horse with a Buggy. Many people believe this will again become the vehicle of the future. 35. A Pony with a Cart. 36. 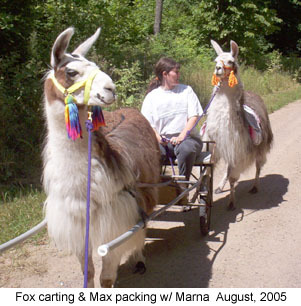 Deron and I have Llamas that Pack and Pull Carts. 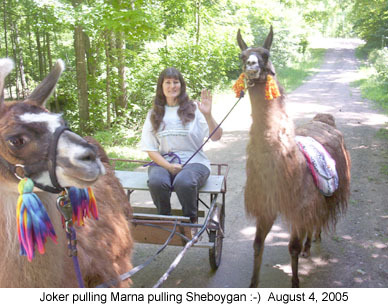 Llamas are wonderful animals that keep coyotes and other visitors away, look out after your other livestock and eat very little, less than a donkey, and a Donkey eats less than a pony. 37. We have donkeys too. They pull Carts and Pack also. 38. Convert an old Mobile Home Frame into a large Trailer. Make sure you have the vehicle to pull it...and be able to stop. 39. Horse Trailers. Many have Sleeping Quarters and Kitchens. 40. Old School Buses. They can be used as is, or giving total make overs. 41. 18 Wheelers. NOW THIS is a BUV! 42. Buy an old car, fix it up just for BOV. Take the backseat out and make an area to haul more of your Camping Equipment. 43. Grocery Cart. No I am not saying to steal one. 44. Luggage Carts. You could fill one up with Luggage Filled with your Preps. 45. Dolly. Yes, the moving type Dolly. You could strap Storage Tubs to one and get out of town on feet. Of course you would have your Bug Out Backpack on your back also. 47. Tractors. When I was a kid we had a neighbor that had a small tractor he mowed his large yard with. Every now and again he would hook up a trailer to it and give the kids all a ride around the big block. 48. Farm Trucks. Those big dump trucks that are used on farms. They are built to hold and haul a lot. 50. 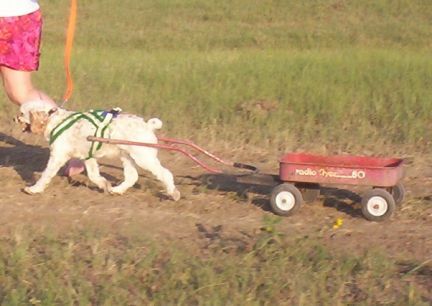 Teach your dog(s) to pull wagons in their size. 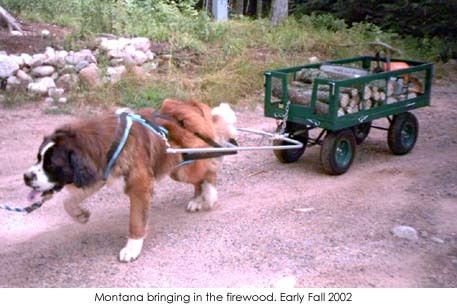 There are all sizes of wagons made and all can be converted for dogs (or other animals to pull. 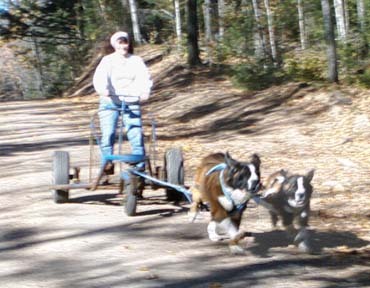 I have information about how to convert the wagons and how to teach your dog to pull on our www.workinggermanshepherddogs.com or www.dogstarkennel.com or even www.workingbigdogs.com If you are thinking about doing this, get to it. Train your dog right away and add a bit of weight slowly to work up to the amount of weight the dog will be pulling. 51. Donkeys can pull and or pack. 52. Build a Wooden Box on Wheels with a Handle. 53. Pick Up Truck with a Camper Shell. 55. JEEPS! This is what they were made for! 57. Luggage on Wheels. Only good on the concrete, but that might help the trip out of town. You will not be as fatigued before having to carry it. 58. Goats are great. Can you have a Goat if you live in the City? Yes. Some Cities do allow doe goats for milk. 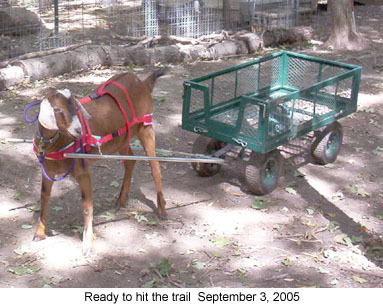 Even small goats can pack or pull a cart or wagon. 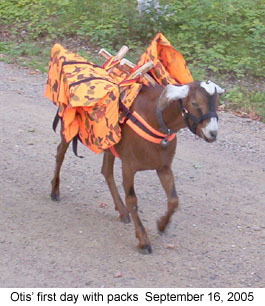 Be sure you have the correct Harness and Training before the day you need the goat to pull or pack. Our first Milk Goat Pulled and Packed. You take your Fresh Milk (and if needed meat) with you like this. 60. Surfboards? Well, if it were a nice day and you just needed to get off the shore for a very short time. Or if you needed to drift along to the shore elsewhere. 61. Trains. Or at least the tracks. Some folks are making Bicycles that ride on the rails. 62. Mules. The actual animal is where the term "mule" came from that folks use for those that are taking items from one area to another. 63. Travel or Band Buses with or without (better) windows. 64. A Stationary Bike. Yes. You read that correct. A Stationary Bike has a wheel and a metal frame that could be fashioned into something that could be used to haul items and equipment for you. 66. Kayak. Again, if you live near water and know how to use the small boat. 67. Peddle Boat. If you live near water and have a place to go on the other side of the waterway. 68. Sledge. Much like a Dog Sled but heavier and longer. 71. If you can find one. And old, lightweight, small, pull behind trailer that opens into a Tent. 72. Child's Snow Saucer. Especially good on snow. Use a tarp to cover your equipment on the Saucer and pull with a rope. 73. Down Hill Soap Box Car. I actually have one of these that I bought cheap at a Garage Sale. The one I have has lots of room for packing equipment into and could be pulled or pushed along the roadway. Our dogs pulled ours for fun. This was before I bought a Rig and or Sled. 74. Dog Rig. This is a vehicle you stand on, kinda like a chariot, that dogs pull. 75. Dog Box Trailer. Dog Box Trailer? Yes. This is a trailer set up for working dogs. There are many compartments (med to large) dog sized. And it could be a very useful trailer to use. One most people will not bother, afraid there might be dogs inside that they do not want to mess with. 76. Ultralight. The wings with a motor. 77. Wheelchair. Seriously. Not a bad choice. Most can go anywhere, handle well and can be loaded pretty heavily. They are also easy to push. 78. Unicycle. You better be pretty good at riding one, and riding it with a heavy backpack on your back. 79. Three Wheeled Motorcycle....with a trailer. 101. Human Feet with your BOB on your back. 80. Ok, so I only came up with 80 types of Vehicles that can be used to get you out of town with some of your equipment. Some might be too silly, others might be laying right at your feet and you had not thought to use the help from them. Others, just make good sense. Good Luck to you if something happens in your area. Try to be ready. Once the water raises in a flood or hurricane hits, you don't have time to pack. NOW is the time to pack and be ready.